“I’ve got dementia and I don’t know where my glasses are,” John Cornwall outwardly told staff at a popular café that he occasionally visits with his wife Lesley. The café staff recognised John and swiftly allayed his fears, telling him they would keep a look out for the absconding spectacles and if they were to be found loitering in the café that they would hold them safely aside until John was able to collect them on his next visit. What struck Lesley about the exchange, was not John’s unabashed announcement of the condition, but how kind the café staff were toward him. “The staff there were quite young and it’s a bit of a trendy place, there were a few looks and a bit of a pause, but when they said “you come in here a bit, don’t worry if we find them, we’ll hold them for you – and you can pick them up next time you’re here” it made me feel good that they were so kind to him,” Lesley said. When on a separate occasion John walked down to that same café to meet Lesley (who after a slight mix-up in communication was waiting at a nearby, albeit rival venue) the staff also kindly guided John in the right direction of the other café and to where Lesley was awaiting his arrival. September is Dementia Awareness Month, and this year’s theme 'You are not alone' was chosen by consumers who often tell Dementia Australia that a diagnosis of dementia can be an isolating and lonely experience due to a lack of understanding, education and awareness about the condition. Lesley said there have been times where she has felt very alone. This Dementia Awareness Month aims to break down some of those barriers and stigma to create more inclusive, kind and accepting communities where people with dementia, their families and carers can feel well-supported, less isolated and alone. John and Lesley “were more than happy to do something to help” raise awareness during September and they both took part in a short video filmed as part of the Dementia Awareness Month campaign. After a few bloopers and some technical difficulties a final cut was shot – which John said was an enjoyable experience. “It will be interesting to see Dementia Australia show our great work,” John said. 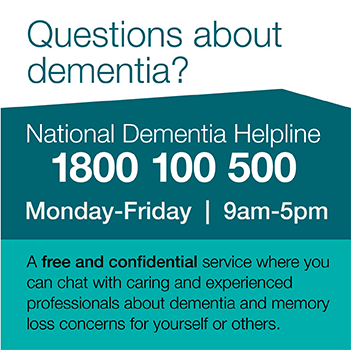 There are a number of events planned for Dementia Awareness Month across Australia. To see what events are taking place near you and activities to get involved in visit the Dementia Awareness Month page on the website and select your relevant state or territory. A key highlight for Dementia Awareness Month will be a national speaking tour by Dr Ron Petersen M.D., Ph.D. who will be visiting Australia from the USA. Dr Petersen is a world leader in the field of Alzheimer’s disease and dementia. Dr Petersen is the director of the US Mayo Alzheimer’s Disease Research Center and the Mayo Clinic Study on Aging and was the personal physician to former American President Ronald Reagan and treated the former president’s Alzheimer’s disease. Dr Petersen will be guest speaker at the National Press Club in Canberra on World Alzheimer’s Day, Wednesday 21 September 2016. If you are in Canberra on 21 September and would like to be in the audience tickets are available to the National Press Club event. If you are not able to be in Canberra, the National Press Club address is televised live on ABC and ABC News 24. Dr Petersen will also be speaking in Sydney on Monday 19 September, Brisbane Tuesday 20 September, Melbourne Thursday 22 September and Adelaide Friday 23 September. In addition to Dr Petersen’s visit, a number of Australian experts will be speaking in some states and territories. Professor Maria Crotty BA, BMed, MPH, PhD, FAFRM (RACP), FAFPHM, FRACGP is a rehabilitation physician based in Adelaide who has a special interest in working with older people particularly those with dementia. Associate Professor Craig Whitehead is a specialist in geriatric medicine, with special research interest in falls, residential aged care and health services for older patients and was involved in establishing a RCT (randomised control trial) of a transitional care unit for people awaiting placement in public hospitals. Professor Jacqui Close is a consultant in Orthogeriatrics at the Prince of Wales Hospital in Sydney and Clinical Director of the Falls, Balance and Injury Research Centre at Neuroscience Research Australia. Professor Crotty will visit Darwin, Professor Close will be visiting Port Macquarie and Tweed Heads and Associate Professor Whitehead will speak in Tasmania during Dementia Awareness Month find out more.